This feature is so cool, if you don't own a Mac you'll buy one. This section lists all existing sets. Select a set to edit by clicking on the set description. To delete a set, select the description and click button "Delete Set". To create a set, click "Create Set". This section shows all properties of a set, including the name, description, and issues. 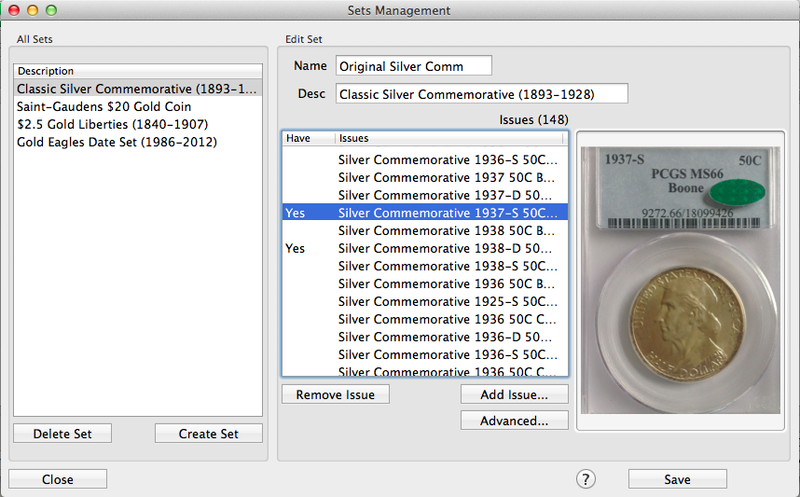 Clicking this button opens a new dialog which then allows you to select a new coin for the set. Use it to add coins one at a time. For example, if you were creating a set of first year types, you would use this option to select the first year of each coin type, one at a time. This option allows you to build sets based on a single Type. For example, if you wanted to create a full Morgan year & mint set, use this option. The Morgan series contains over 400 coins, adding them one at a time would take many hours of work. This option will do that in seconds. Use this to remove an issue from the list of issues. Select the issue you want to remove and click Remove.